For those who might not yet know, February 10 happens to be the birthday of our current Prime Minister Lee Hsien Loong. PM Lee was born on this exact in the year 1952, making him exactly 65 years old as of today. As the rest of the Parliament members threw their leader a surprise birthday party ahead of time, PM Lee has settled into a work day and Chingay festival night to pass the day. Singaporeans might know our jovial Prime Minister as the one who legalised gambling in 2005, as well as the one who proposed a ministerial pay cut that saw a decrease of almost 30% across salaries. But did you know that PM Lee also has other killer skills other than being an industrious leader? On one Friday on October 1 2016, Singaporeans got the ultimate TGIF when the skies decided to treat all of us to a double rainbow. Cue Instagram and Facebook feeds being flooded with #samesamebutdifferent photos of the rainbow, taken from various parts of Singapore with cameras of various resolutions. 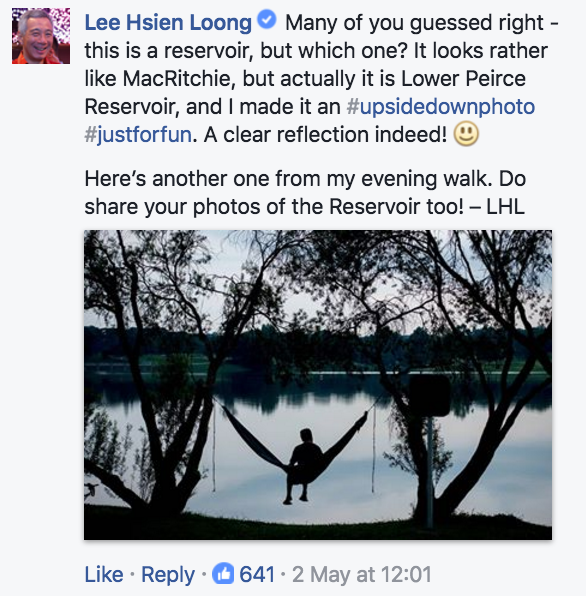 The social media post that took the cake, though, was by our Prime Minister Lee Hsien Loong. What started out as a simple post requesting for Singaporean netizens to share their shots as he “wasn’t there [to capture the rainbow] with [his] camera” quickly turned into a mini national project of sorts, with the comments section being flooded with contributions. The post has over 2,000 shares and 1,106 k comments to date. This, however, isn’t the first time that PM Lee had won at social media. Let’s take a look just a few of the other times when he showed off his social media cred. Possibly one of his firsts to achieve semi-viral status, the post showed us his softer side – the one that not only took the time out to appreciate an adorable owl, but also the one who promptly engaged in AVA and Bird Park (“but not the police :)”) in making sure the owl safely gets back to its natural habitat. Through the post, he also helped to educate us in the responsible, and best ways we can deal with, and preserve wild flora and fauna via the activation of various agencies. Posted in 2014, we now look at these photos with bittersweet emotions. Regardless, the message from PM Lee is evergreen, and what better way to remember not only the roles that the older Mr and Mrs Lee played in PM Lee’s life, but also how our own parents have selflessly taken care of, and shaped us into the people we are now. As a tie in with the Mandai project, PM Lee posted up a photo from 1988 – steel-framed glasses and all, of himself with a hawk at the opening of the Fuji Hawk Centre in the Bird Park. Of course, like all social media users, he did not forget the inclusion of hashtag “#throwback” in his caption. We kid you not when we say PM Lee’s definitely in with social trends and the keywords that come with it. PM Lee is not only a selfie pro, but a photography enthusiast as well, taking landscape shots of the places he visits. This time round, he decided to engage his social media followers to do a little investigative work and “#guesswhere” he took the photo at. Needless to say, netizens tried their hand at guessing, and not one to leave us in suspense, PM Lee posted the answer – but not without sharing another photo he took. Not ashamed to show off their love for each other, PM Lee and Mrs Lee posed for this absolutely adorable shot in lieu of Valentine’s Day this year. Now, who said that couples on social media are only made up of narcissistic millennials with #followme shots? Oh, don’t forget the time when Mrs Lee took a mirror photo of PM Lee getting ready for an event! Can we get an “aww”? I’m sure we’ve all experienced the pains that goes into taking a jumpshot. Most of the time, they’re epic fails with awkward limbs and even more awkward faces – but PM Lee and co. seemed to have nailed it in this shot for youth day. The popular photo (it has close to 3,000 shares) had also called upon netizens to post their own jumpshots, which many complied to, with many taken at locations around the world. A ‘notorious’ selfie fan, PM Lee posted this one with Golden Boy Joseph Schooling, with the caption “Usually people ask me for selfies, but today I felt so proud to ask Joseph for one! :)”, in a reversal of roles of sorts. 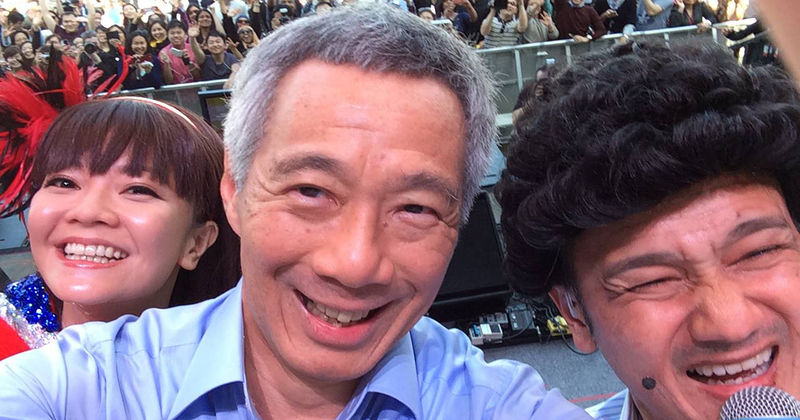 With his signature bright smile, the post is extremely casual, even when it features 2 prominent Singaporean figures. His social media engagements are not simply random, spontaneous posts, though. In an interview with ASEAN journalists, PM Lee mentioned that since “people were spending more time on social media platforms like Facebook and Twitter, […] he wanted to have an online presence there too”. He also noted that while online platforms are not the best places for ‘heavy’ topics or speeches, they are excellent in helping to reach out to those on Facebook “who will not be reading speeches”. The very public, and casual nature of social media posts are also a tool to make him feel more relatable to Singaporeans, as what we see and know of him is not simply via policy-making speeches and announcements on the newspapers and television. With over 3.6 million social media users in Singapore in 2015, according to We Are Social, it’s thus no surprise that PM Lee has strategically been attempting to make waves online. And you know what? We’re not complaining. Also, Happy Birthday PM Lee!